The world that Bix has misplaced is his own Wyoming of the late 1800's. His Laramie County has a different county seat, which can't be accounted for by the change in years. His Laramie has dirigibles overhead, like clockwork twice a day, and golems working the fields, shepherding, and mining. Bix is as blas� about these golems as you would be about owning a vacuum cleaner. His world has always had golems around, a few people who know how to make them, and make them work, though they're dying off with the advent of technology, becoming more or less obsolete. The golems in Bix's world are simply animated objects, and their form ranges from an animated first base to a multi-armed construction with pseudo-human features. Magic exists in the world of course - how else are you going to get golems running about? - though the impact of this magic is low key and rare. The people who can actually animate golems are getting fewer and farther between, and spirit magic is largely in the province of aboriginal peoples. All of these ideas come into play as Deputy Bix, his Sheriff Matt, and cranky almost father-in-law discover the dreaded necrogolem deep in a mine. Necrogolems are of course animated from corpses, and have been bad mojo for a thousand years. Trying to meet this menace and trying a little magic of his own is what eventually shoots Bix out of his world and into ours. The bulk of the book then, deals with why necrogolems are so bad, if they're bad (misremembered lore, etc) and just what the heck Laramie County is going to do about it. As I've noted before, Mr. Rand has a writing style that makes his fiction seem real, or in another trite metaphor, his prose comes alive. I figure I can get away with that one, since we're talking about golems. At any rate, his style is easy and his dialect, or rather Bix's dialect are genuine and enjoyable, not once approaching that over-the-top, 'enough already' trap that so many writers can fall into when writing in dialect. Bix's displacement also calls upon another popular theme in science fiction - did he displace himself, or actually change the world itself? There are several forays into themes such as this, and wonderings and wanderings, but in this there is not much resolution, one of the books weaker points (but keeping in character for those involved). Lastly, the novel itself is very Western. And I don't mean because of the six-guns and the setting. Its authenticity comes from something the writer probably isn't even aware of (a sneak peek at his bio shows he's from the area) because he's immersed in it, which is the unbridled, common sense attitude of those who live in the west. Something needs doing, you do it. There's a wily necrogolem wandering around the area, up to god-knows what. Do we call in the cavalry? Hell no. We deal with it. 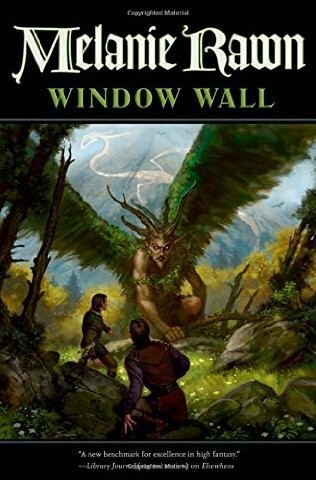 This authenticity and reflection of values in a fantasy setting is one of the big reasons that this book feels as "real" as it does, and makes it such a pleasure to read. So whether you're a fantasy reader with a guilty western fetish, a western reader with a guilty fantasy fetish, or one of those new fangled Steampunk readers, this would be a fine book to add to your collection.